It started out better than perfect. I got a ride to the airport and arrived super early. I discovered that my flight was delayed by half an hour, but Cely was there and we went to grab something to eat. Eli and Frankie showed up soon afterward and we headed over to board the plane. Lo and behold, I see some girls I went to high school with and spent the wait chatting about life in general. We get on the plane and managed to get seats next to each other (which is amazing since the plane was packed!). I end up sitting next to this really interesting guy and spent the trip having deep conversations about which celebrity is hotter and Sudoku. 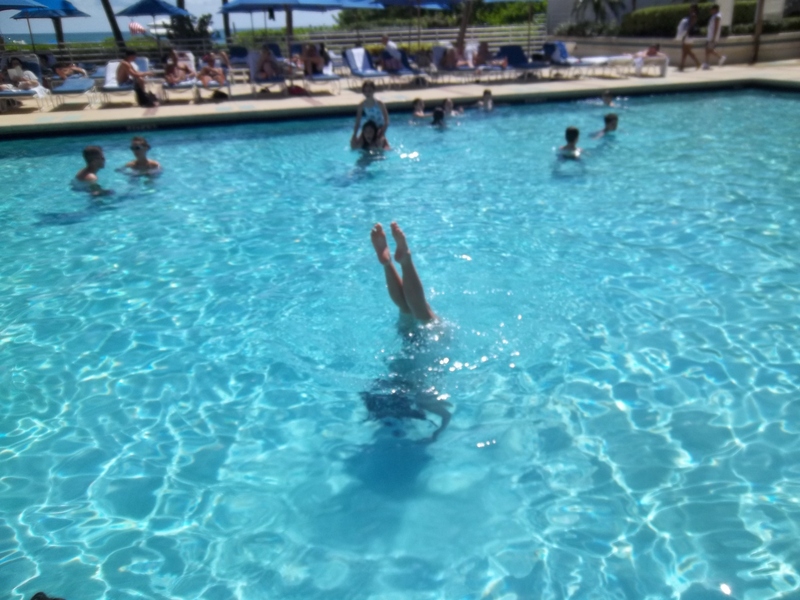 Saturday was just as good, sat by the pool and watched Cely do some acrobatics. We went to eat at a Cuban restaurant called Little Havana and ended up at a Walgreen’s, where I made my début as an actress. Things started to go a little downhill after that though. We went to Mango’s and had some more food for dinner. I wasn’t very hungry and we caught a bit of the show inside. I tried to look good, I did. But once we started walking, I had to take my shoes off or I would have DIED. I also started to feel rather sickly at that point too. Sunday was more chill than anything else. I though my head would explode and was up since 6:45…doing not a damn thing. I eventually had to take a nap and woke up just in time to get everyone out of the room on time for our 11am checkout. We lounged by the pool (well I lounged, the others decided to do some last-minute swimming…) and then tried to go get some fish tacos…that didn’t work out at all. So we went to the airport. At this point, I had gotten the message that my dad was in the hospital and wasn’t in the mood to even look at the others. I just wanted to go home so my mom could read the text to me and we could figure out what was going on. We land and I’m feeling like a helium filled balloon, just floating behind the others. I have to admit, I was not the best company after Saturday afternoon, but everything just came crashing down around me and I just didn’t care anymore. I’m currently sporting long distance hearing. The descent of the plane into New York was murder on my inner ears and they still aren’t acting right. And of course still feel sick and I still have no word about my dad.